I am reading what was probably the first book downloaded by Steve Jobs on his iPad 2. 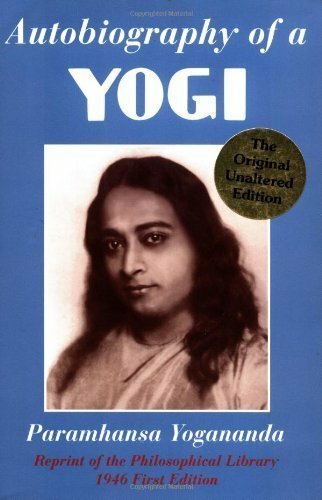 The book: Autobiography of a Yogi by Paramhansa Yogananda, an Indian yogi who moved to America in 1920 and died in Los Angeles in 1952. At his house the following day he was still on a high. He was planning to fly to Kona Village the next day alone and I asked to see what he had put on his iPad 2 for the trip. There were three movies: Chinatown, The Bourne Ultimatum, and Toy Story 3. More revealingly, there was just one book he had downloaded: The Autobiography of a Yogi, the guide to meditation and spirituality that he had first read as a teenager, then reread in India, and had read once a year ever since. Steve Jobs arrived in India in early 1974, met up with his Reed College friend, Daniel Kottke, who came later in the summer, and they wandered around the country. Jobs was only 19 years old at the time. He quit his job in Atari to come to India and spent seven months in the country. Autobiography of a Yogi is the memoir of a remarkable man. Paramhansa Yogananda was the son of a wealthy, senior Indian railway official. Born into a Bengali-speaking family, the boy was named Mukunda Lal Ghosh. Later, he became known as Paramhansa Yogananda. It is usual Indian practice to adopt a new name when one becomes a monk or a yogi. Paramhansa Yogananda was born in Gorakhpur, India, on January 5, 1893, and died in Los Angeles on March 7, 1952, at the age of 59 – almost three years before the birth of Steve Jobs (born in San Francisco on February 24, 1955 – died in Palo Alto on October 5, 2011, at the age of 56). The yogi played a historic role. “Paramhansa Yogananda was the first yoga master of India whose mission it was to live and teach in the West,” says the preface to Autobiography of a Yogi. The book was first published in 1946. “I left India in August 1920 on The City of Sparta, the first passenger sailing for America after the close of World War I,” the yogi recalled in his book. I picked up the book after reading Isaacson’s biography of Jobs. Paramhansa Yogananda naturally reflects on his spiritual life in Autobiography of a Yogi. But he also writes about his parents and siblings and the things he did as a child. As a result, the reader gets a picture of life in a wealthy Bengali family in the early 20th century. The book describes various miraculous events. Sages with extraordinary powers inhabited Calcutta (now called Kolkata), Benares (Varanasi) and other places described in the book. The third chapter, for example, has the title: The Saint with Two Bodies. There, Paramhansa Yogananda describes simultaneous sightings of a sage in Benares. He says while he was talking to the sage in a room, the seer appeared before another follower in another part of the city! It is impossible here to recount all the miracles described in the book. This sounds like positive thinking and the law of attraction. Is that true? Opinion is divided. How can we say people are poor or ill as a result of thinking about poverty and disease? If so, we only have to think about wealth and luxury to get rich. Obviously, thinking – or, in Proctor’s words, “the images you’re holding in your mind” – is not enough. Something more is needed. For everyone that asketh, receiveth. And he that seeketh, findeth. PS: Steve Jobs also liked the poems of Dylan Thomas. I love Fern Hill, In My Craft or Sullen Art, and Do Not Go Gentle into that Good Night.